Now and then, we have seen great innovation which has improved our standard of living. If we talk about technology; how far we have gone? From making food to run a business, technology has changed everything around. For example, the business and its core parts have moved online to reach a wider audience and increase sale. Entrepreneurs (Every industry is opting for automation to increase their sale and collect users’ data.) have seen great results in the business with the help of advanced technology such as AI chatbots, big data, and machine learning. Question is, are you ready to utilize the outstanding technology for your business? If yes, then let me introduce you to the realistic E-commerce chatbots. E-commerce chatbots is a smart AI chatbot that helps you and your company to manage and serve a number of customers. Its shows guaranteed results in providing customer support and increasing sale. The interesting thing about the E-commerce chatbots is that it helps you to see unified customers report. The AI-powered chatbot can collect data, understand the customer, meet each and every customer’s needs, and based on the buyer’s activities it help you improve business strategies and products. The role of the E-commerce chatbots in the eCommerce industry is managing the business effectively. This will automatically drive more customer to the business. Whereas, outstanding E-commerce chatbots provides high functionalities to improve your ecommerce store and also help you to collect data. By adding it to the ecommerce site one can decrease cart abandon rate, provide 24*7 customers support, and identifies better ways to reach the audience. 1. Customer Support: – You can stop investing money in customers support executive as the E-commerce chatbots can process thousands of request at a time to provide advance support. Here, customers can avail support anytime. Also, chatbots can attend consumers in a difficult situation without human support. 2. Data gathering: – Based on the customer’s interaction and activates, smart E-commerce chatbots can store customers data and analysis the same, so you can make better marketing strategies. With the collected data, in the future chatbots can even pitch the products the customers. 3. Marketing: – With simple steps, you can get in touch with potential customers. With features like broadcast and auto response, chatbot can promote your product and services. With the help of collected and marketing tools, chatbots will suggest products to the customer that they would probably buy. For example, you can send a direct/personalized invitation to the customers on schedule time. 4. Powerful insights: – AI functionality in the chatbot, chatbots suggests strategies that can directly impact your sale. With the reports, you can make a decision clearly and faster. Bots analysis this report from the all possible aspect of failure, so you can be sure when you are making a decision. 5. Customers Point view: – It is very easy for AI bots to understand customer point of view. Chatbot can answer customer questions before even consumers ask for it. This is possible because, in the background, chatbots gather all the relevant information and find the possible connection between the customers. 6. Cart abandon: – This is one of the major problems when we are dealing with online customers. But to eliminate this, chatbots can help customers to complete the shopping where they left. These chatbots are capable of navigating customers to different pages. 7. Cost-effective solution: – The cost of the E-commerce chatbots is 80 to 90% less than hiring the number of customer support executives, sales executive and other employees you would probably hire for increasing sale. Here E-commerce chatbots are doing all for at cost effective. Now the question is, how practically it can help your business? If we rely on the facts and statistics, there are 1.3 billion active users who use Facebook messengers to connect with people and brands. If you have your e-commerce site running with E-commerce chatbots then you can reach as many as customers you want. Again, one of the important function of the E-commerce chatbots is to connect with consumers and help them to meet their end needs. According to Gartner, by 2020, 85% of our engagement with businesses will be done without interacting with another human. Instead, we’ll be using self-service options and chatbots. Your business is always live and help customers to check out products with simple steps. Does this sound interesting? Why do you need E-commerce chatbots? Increasing sale, customer support, abandon rate, broadcasting, auto response, report and analysis. These features are not the game here. If you are looking forward to understanding your buyers and improve your customer shopping experience and products, then this is the reason why you need them. Today, there are over 300,000 active chatbots on Facebook Messenger. Facebook Messenger Chatbot can handle N number of the customer at a time; this sounds cool right. If you have this, your patrons don’t have to wait for customer support. What are the exclusive features of E-commerce chatbots? There are many exclusive features, but let me tell you a couple of them that can blow your mind. One of them is Shopping Bot, yes it can help consumers to shop. Some customers find it very difficult to find the right products for their needs, but when they have the support of the Shopping Chatbot buyer can simply click on the products that are suggested by a bot and can proceed to checkout. Another great feature is that it auto generates report and analysis. This can help your business to know where you can improve in the market and how to connect with more customers. Basically, you are growing your business without investing more money. Here the ROI is more, as this will be a one-time investment. Once you integrate them with your website, you have to do nothing and that is all to improve your marketing. Yes, it is this simple. As AI chatbot does all the hard work for you. Do you want to try for yourself then contact us. 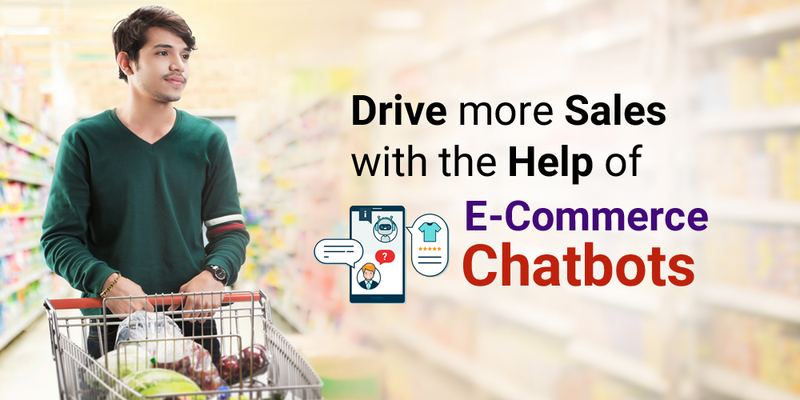 We are a leading e-commerce development company and can help you integrate a quality live e-commerce chatbot on your e-commerce site.